A cold front cut off the serious spring crappie spawn before I could get out, but some action was still to be had at James A. Reed Conservation Area, a complex of beautiful small lakes on the southeast corner of the KC metro area. 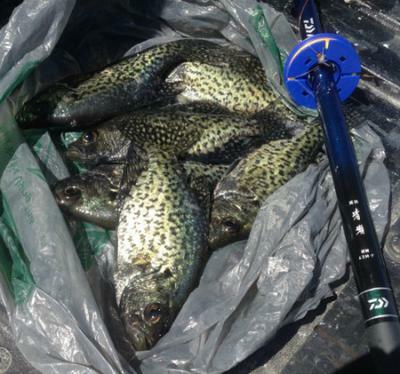 There were a few folks around using minnows and jigs under bobbers. The Kiyose 43MF with a white Killer Bugger was catching fish faster with a lot less hassle. The takes were very soft. When the line straightened a little a snap of the wrist would set the hook. 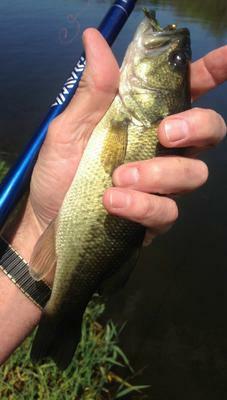 This nice bass and some bluegill also liked the Killer Buggers. Walking along the shore with my rod and a small gear bag seemed almost like cheating compared to the people working so hard with all the bait, bobbers, coolers and buckets. I guess Dr. Ishigaki got it right when he said it was simple. I do think casting and retrieving shows the fly to a lot more fish than lobbing out something that just hangs under a bobber. If you have a fly they like - you win. Alan: where do you do most of your fishing at James Reed? I've done pretty well at Catclaw and Plover with a Tenkara rod. I'm hoping to get out to the latter soon to catch some stocker trout.